Telematics is on the rise, and it’s causing huge paradigm shifts in the insurance industry. New innovations in machine-to-machine (M2M) and IoT technologies are driving the next generation of products and services for auto, home and health insurance. The Internet of Things (IoT) is collecting data through sensors about the location, performance, usage and operating status of millions of devices and products. Sorting through that data to gain meaningful information is the business of telematics. Berg Insight, a Swedish research firm focused on IoT and M2M market research, recently reported that there will be more than 153 million subscribers of telematics services by 2020. Insurance carriers are among the earliest adopters of commercial telematics subscriptions, sensing the value of gleaning more direct information about customers’ risk behaviors as well as the status of insured property. According to the National Association of Insurance Commissioners, just under 10% of auto insurance policies in the U.S. are written for drivers who’ve agreed to allow telematics to be collected about their driving. Progressive Snapshot is one such (as of now) voluntary service. Each day, devices on their cars reveal their driving habits to the insurance company—tracking everything from sudden acceleration and stopping to miles driven and speed patterns. Today, a handful of companies offer usage-based insurance surveillance to identify “good drivers” for discount premiums. As the use of telematics progresses, insurers will also use telematics to identify “bad drivers” for rate increases. Already, Progressive has announced plans to levy a surcharge on drivers with poor habits, as revealed by the Snapshot service. By 2020, over one-third of auto insurance carriers will use telematics to individualize the risk of each driver and offer customized premiums—much like the life insurance industry has been able to do with actuarial data. In addition to being able to reward good or surcharge bad drivers, the concept of usage-based insurance fits the car insurance model perfectly. Why not substantially lower premiums for people who don’t drive many miles or don’t drive often? 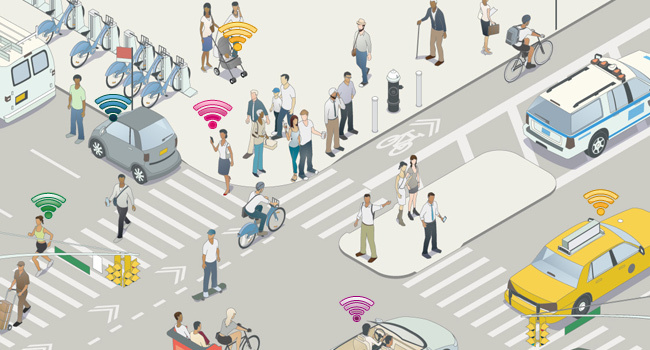 Today, one in five cars report driving data directly to auto manufacturers. Usage and automobile performance information will be combined to help auto manufacturers improve the safety of their products, helping to save lives and reduce injury and property damage. Over time, telematics may help to lower the average cost of car insurance. In the smart home, more proactive fire and break-in detection can help reduce losses for home insurers, keeping premium costs in check. But telematics will soon do more than that in the home insurance industry. According to Berg Insight, only 6% of North American homes are connected today, but by 2020, 28% of homes will become part of the IoT. Imagine if your home had dozens of IoT sensors, monitoring everything from the security to structural safety and home appliance performance. Rapid changes in temperature or air quality could result in a proactive alert to the fire department. A breach of the perimeter notifies the police department. Appliances could notify you of potential problems, from electrical short circuits that could cause a fire to malfunctions that could result in damage, such as a broken sump pump leading to water damage. Telematics-driven monitoring systems could even be used to shut down machines if they are dangerously malfunctioning, lowering the risk of electrocution or fire. Home insurers can also use the IoT to lower costs. Some companies have already begun to use drones to fly over homes and assess damage after natural disasters. One could easily see an application for auto insurers to deploy a drone at the scene of an accident. Telematics are already beginning to be deployed in the healthcare field, to help monitor the status of patients as well as life-sustaining medical devices. Soon, the “Connected Hospital” will enable patients and healthcare workers greater freedom of movement while tracking more information than ever about patient status and condition. IoT devices will enable some patients to recover and rehabilitate at home who would have needed to stay in a facility before. Some health insurers are already giving customers free fitness tracking devices and lower premiums in exchange for meeting exercise requirements. Here again, usage-based insurance could offer patients individualized premiums based on their risk profiles and healthy behaviors. Health telematics could assure a medical team of patient compliance with diet or exercise protocols, so they could make meaningful diagnoses that lead to earlier treatment. By shifting focus to wellness and earlier intervention, telematics will hopefully lead to lower long-term costs for health insurers and better outcomes for patients. To gain full customer buy-in for telematics, insurance companies will need to address two primary consumer concerns—privacy and security. Most consumers want more convenience and value from the products and services they purchase; however, there may be limits to how much information they are keen to share with insurance providers and manufacturers. For example, there’s no question that a future smart refrigerator will be able to track what, when and how much your family eats. But do you want the fridge to tell your doctor? Your health insurance provider? Would you feel differently if sharing your data meant you’d receive better care or lower premiums? It’s easy to see why insurance companies have been early adopters of telematics. Further business model innovations in this industry will be driven by the availability of real-time usage data. Five years from now, there’s little about your driving, your home or your health that won’t be impacted by the IoT and telematics.